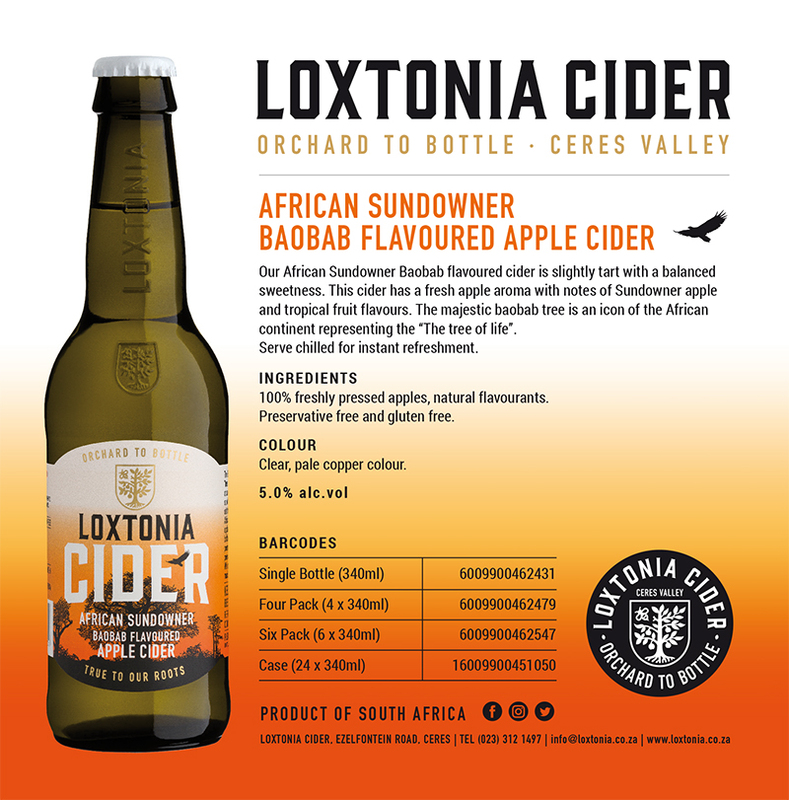 Larry, as a fruit farmer, launching Loxtonia Cider in 2018 alongside your daughter, Ali, was an incredibly brave adventure to take on. Update us on progress made? This has been an ongoing project since 2013 where we did a huge amount of research and travelled to different countries in search of trends and inspiration. Seeing it come to life after such a long haul has truly been so incredible. “Working alongside my dad is something so special and I continue to look up to him and learn from him each and every day, and have since I was a little girl,” says Ali. 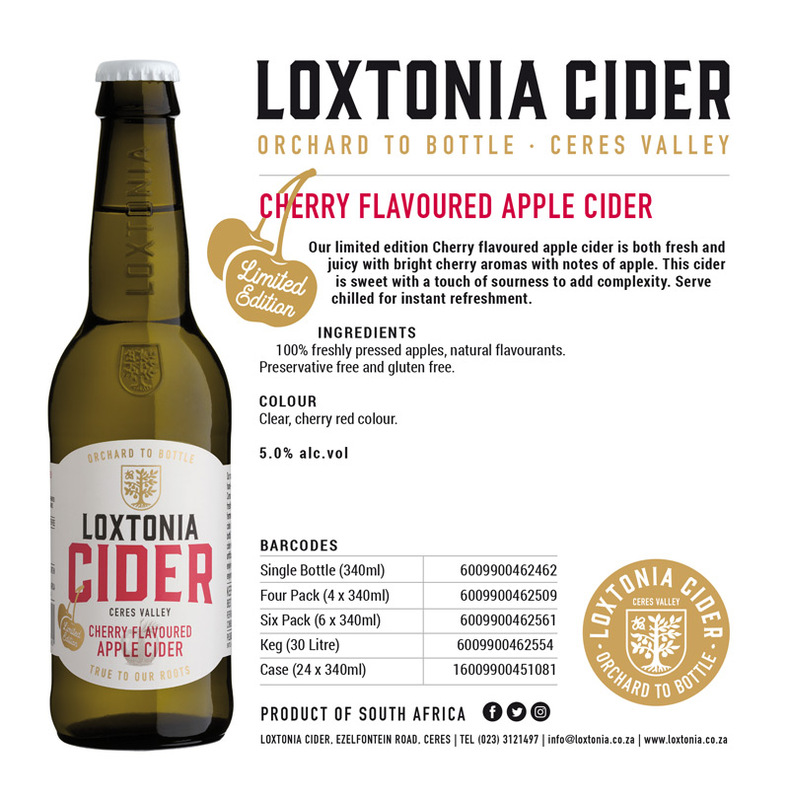 Our “Orchard to bottle philosophy” is one that we emphasise in all that we do and we hope to inform consumers on all the aspects of our Ciders and our concept of farm freshness. We are still at the early stages of launching but we are excited about what is to come – we have a good feeling about 2019. The best has been working together, as father and daughter – as family values is what we are all about. Turning something that we are so passionate about into a reality – and seeing our brand come to life. The little things from watching the apples grow on the trees, to making our cider, tasting our product at every stage and of course our final product. 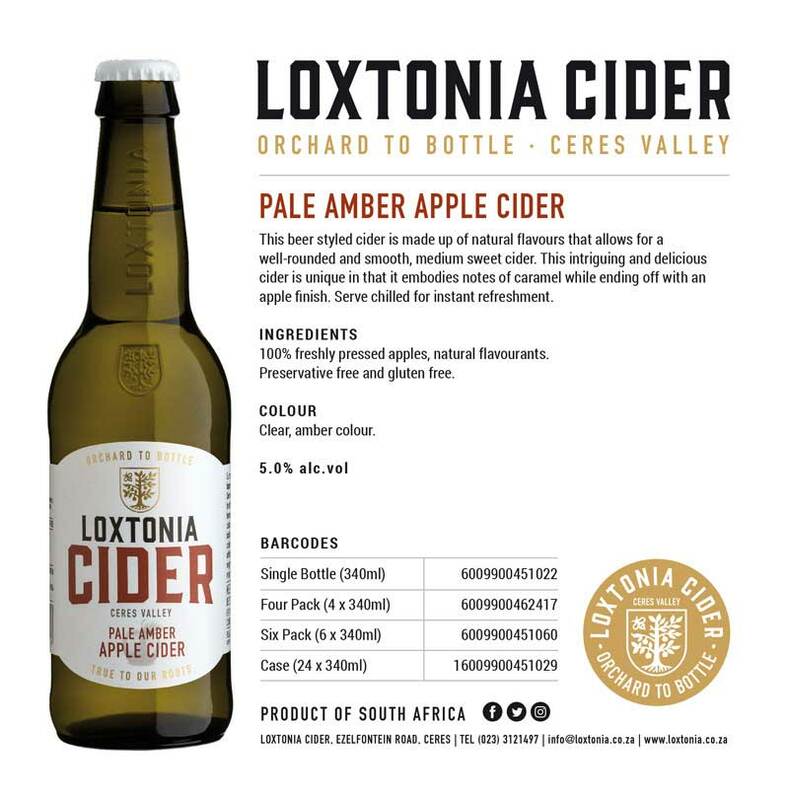 Creating our brand and all its entities, interacting with people at the markets, getting product listings, and just slowly but surely growing our Loxtonia Cider brand. 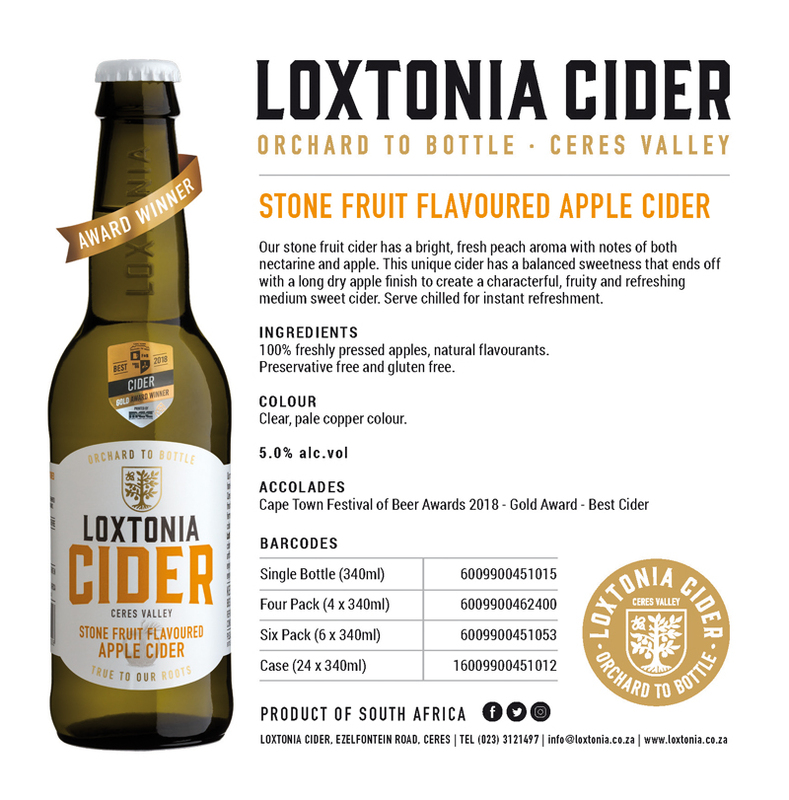 Lastly, winning best cider (the Stone Fruit Apple Cider) of 2018 at the Cape Town Festival of Beer – WOOOO! It was a huge challenge finding the right equipment for what we had in mind and getting this brought over to South Africa. The installation of all the different parts of machinery was arduous in itself, as was learning how to use the equipment – it required lots of training and patience – something which we have learnt a lot about recently, being new to this industry. 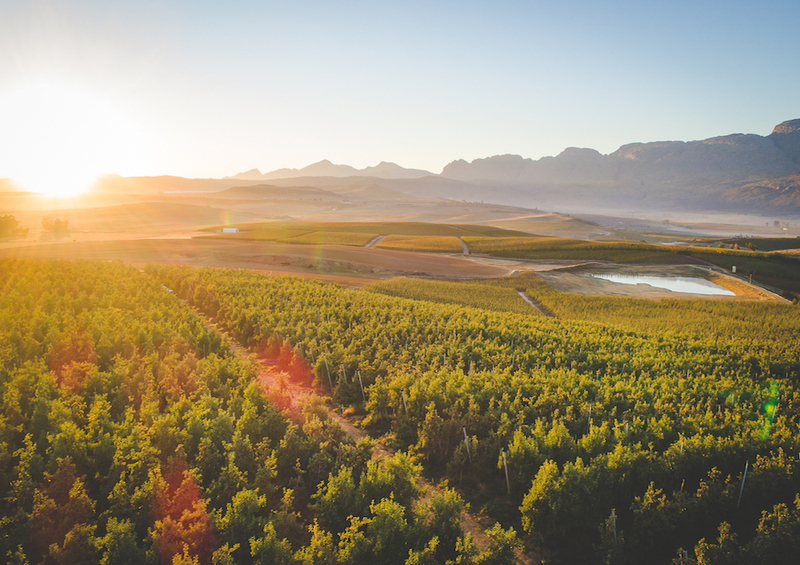 Load shedding has also been a huge factor for us with our production process, as well as bottling. Then there was the the lengthy process leading to the launch, as you always think you are done and ready to rock-and-roll but alas something else pops up and it feels like you take 5 steps back. Once launched, ensuring products are in all stores and constantly maintaining all these stores and looking for more business is an ongoing challenge that we will continually face. To try and synchronize everything is very difficult as there as always delays and everything takes longer than anticipated. Lastly, there are daily challenges and curve balls that hit you from every direction but you know what they say – what doesn’t kill you makes you stronger! And, with the support and encouragement of our amazing family and team, there is nothing that we cannot get through. Although we have had challenges, we have also had a lot of fun in the process and the pros most certainly outweigh the cons. We have learnt such a lot in every different sphere of our new business venture and have really enjoyed coming up with a brand that is very close to both of our hearts. There is nothing you can’t achieve if you put your mind to it. Staying positive – it is not always easy when the going gets tough, but this is something we always try to keep up. We always say that ‘Rome wasn’t built in a day’, so we just have to be patient in all that we do. Our family values are honesty, commitment and sustainability and these are also the core values of Loxtonia Cider. Treating people with respect is also of utmost importance to us. Larry always says and it holds so true – never treat anyone like you wouldn’t like to be treated. Be kind, always and you will reap the rewards in life. Your goals and plans for 2019? We have so many plans and goals, which we aim to fulfil in 2019. We think it is crucial to be creative, innovative and true to our roots in all that we do. We also have a few more flavours up our sleeve, which we will be bringing into the market early next year! We really do hope that people enjoy drinking our cider as much as we enjoy making it. 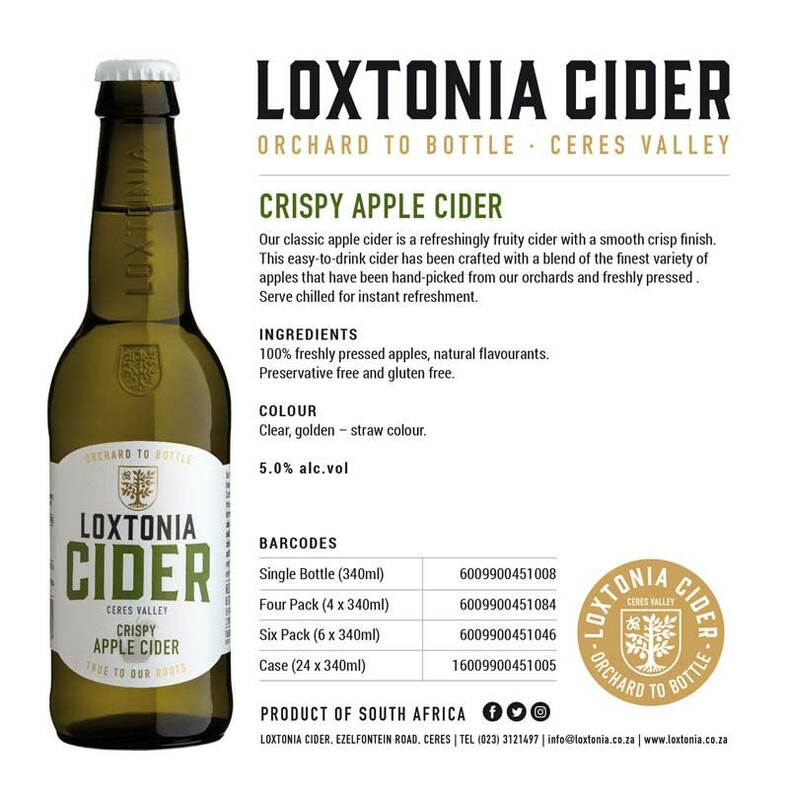 Any plans for exporting Loxtonia Cider? “Definitely – we have a few opportunities in the pipeline where we will be moving product overseas – we cannot reveal just yet, but we will be sure to keep you in the loop,” concludes Larry with a twinkle in his eye.